Can I leave my military pension to my child with special needs? The federal government offers the men and women who make up the U.S. armed forces an insurance plan that covers retirement income that is lost when the service member dies. Called the Survivor Benefit Plan, the program gives widowed military spouses and children a monthly payment that is up to 55 percent of what the deceased had received as part of his or her retirement pension. The plan is an attempt to help ease the blow that is common when the military member dies and no longer receives a retirement pension. But for military families who have a child with special needs, Survivor Benefit Plan income is not enough to cover all expenses. The family has likely sought Supplemental Security income, Medicaid and other public assistance programs to help fill the gap. A child with special needs who is listed as a beneficiary of the Survivor Benefit Plan can have those important public assistance programs taken away, which has been a huge worry for some military families. There is good news for military families who have children with special needs. In December 2014, former President Barack Obama signed into law the Disabled Military Child Protection Act, which allows a mother or father who serves to provide survivor benefits for a child with special needs by having them placed in a special needs trust. Until now, the government did not allow that option, because it maintained that a trust was not a person and therefore could not be named as a beneficiary. The new law allows military families to put the portion of their Survivor Benefit Plan that has been designated for their child with special needs into a first party or self-settled trust so that SSI and Medicaid benefits can remain intact. There are rules, however, that require Medicaid reimbursement once the child with special needs passes away. 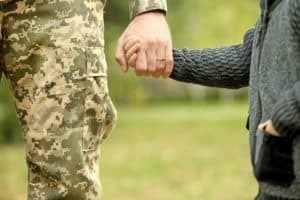 If you are a military member who has a child with special needs, it’s important that you speak to a special needs planning attorney as soon as possible. Give yourself peace of mind in knowing that your child will be protected just as you protected our country.